Could the arts exist without alcohol? This week, I'd like to continue on the topic of making money in music. In the past, I've blogged about music funding after labels, and writing Christmas music straight for TV, because it's one of the few protected revenue streams. 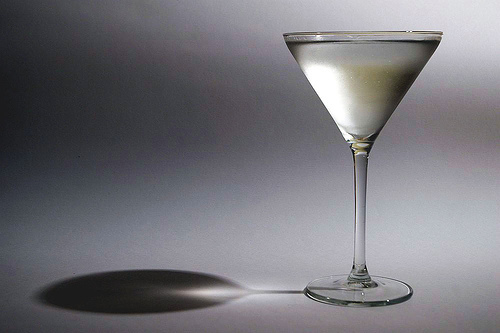 This week, I'd like to speculate: Would the arts be able to survive without alcohol? If you are wondering about the connection between the two, while musicians usually don't make money directly from alcohol, a lot of the musical performance infrastructure is built around alcohol revenue. Venues often don't make very much money from renting out their spaces to acts; instead, they use alcohol (and to a lesser extent, other concessions) as their main income stream. And not just popular music, but classical, opera, and jazz. Early jazz was funded almost entirely by alcohol (1). Without revenues from alcohol, many venues probably wouldn't be able to stay in business, making it hard for musicians to perform. This is especially true for small clubs, often the only place starting acts can play. And since live performance is about the only way musicians make money anymore, cutting off alcohol revenue could be disastrous to musicians (2). Why would I ask this question? After all, alcohol's connection to music will not end in the foreseeable future. Well, first, I'm a teetotaler myself, and if I ever became a popular performer or started a music venue, I might feel a little uncomfortable paying my bills with alcohol sales, even though it's the customer's choice. Second, music's dependency on alcohol makes me wonder how little our society values most music. Many people don't want to pay for music (except for maybe a few big live performance acts), yet they feel okay paying high mark-ups for alcoholic drinks all the time. Do we really value music so little? I realize that the immateriality of music is partly to blame (it's much easier to charge for a product than something ephemeral you hear), but I think the point stands. Without alcohol, it would be almost impossible to fund almost ANY type of music without state funding, private donors, or an attitude change where people paid as much for music as they would for alcohol. Are music and alcohol consumption so different? They both give pleasant sensations and help people have a good time. They both can be in the foreground or the background of a social experience. Music when consumed to excess, however, is not as dangerous. So, do you think arts can survive without alcohol? How? Is this a silly question to ask? Would our culture ever pay for music as much as they would for alcohol? (1) Even today, you often don't pay for the music when you go to a jazz club, but instead you pay a "cover charge," which pays for one alcoholic drink. (2) Finances aside, alcohol is also an important part of some music cultures. Irish folk music comes almost entirely out of the pub culture, where musicians meet and play their tunes together and swear that they play better when they're a little "greased up." Who is that, strutting around in leather pants and singing like Jim Morrison? It's Jimmy Fallon. While Weird Al did pretty good at Jim Morrison, I think Jimmy Fallon does it better. While Fallon changes the melody of the Reading Rainbow theme, we can still recognize the song because the rhythm remains basically the same. Fallon also gets Jim Morrison's delivery just right, with the swagger, understated beginning, and musical build up to a screamed repetition. And of course, the musical lull for poetry in the middle of the song. Fallon's choice of lyric was also inspired for this parody. As the Door's songs were often thinly veiled treatises on drug use, the words of "Reading Rainbow" could come straight out of a book of psychedelic imagery. For example, the first line: "Butterfly in the sky, I could go twice as high." In one blow, Fallon manages to poke gentle fun at the Doors over-serious antics and the strange lyrics of the Reading Rainbow theme. Fallon never ceases to surprise me with his musicality. Either with his acoustic classroom instrument versions of pop songs, or his imitations of famous musicians, usually doing famous TV show themes (Check out Fallon as Neil Young singing theme song of the Fresh Prince of Bel-Air). I hope his quirky, gently parodic musical numbers continue as he takes over the Tonight Show. Do you have a favorite Jimmy Fallon musical vingette? 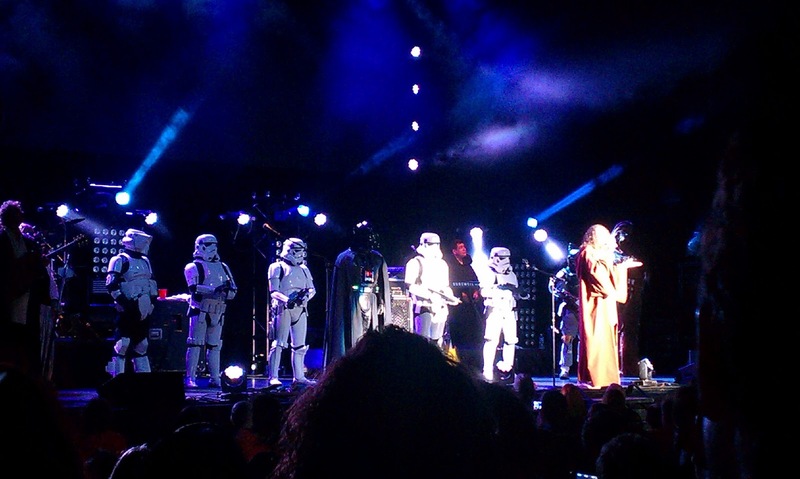 Last Wednesday, I had the pleasure of going to see Weird Al live in Raleigh. I can't say I follow his career and music religiously, but I grew up listening to him and occasionally keep up with what he's doing. It's equally weird to try and imagine popular music without him AND that he's still putting out new music and comedy thirty years on. This was not your normal rock-concert crowd. For one thing, there was whole range of ages, including children. Weird Al's music invites children in. Kids' continued affinity to his music also lets him continue to be popular, while the audience of other 80s rockers continue to get older and grayer. Because of that, I think he'll still be popular for years to come. He also inspires more fanaticism than most: I've never seen so many T-shirts bought and worn per capita at a concert. Even though the venue wasn't filled, everybody there was pretty excited. I bet Weird Al's so thankful that Lady Gaga came into the scenic. I mean, "Polka Face"? It's like a gift to him from a higher power. Weird Al's spot-on Jim Morrison impersonation made me realize that Al actually has quite a good voice. I guess that makes sense, since he's able to sing all of those shows and stay vocally healthy. He's got quite a range, too. That also means that he sings and speaks in a high, nasally voice because he chooses to; it accentuates his character as a prankster. 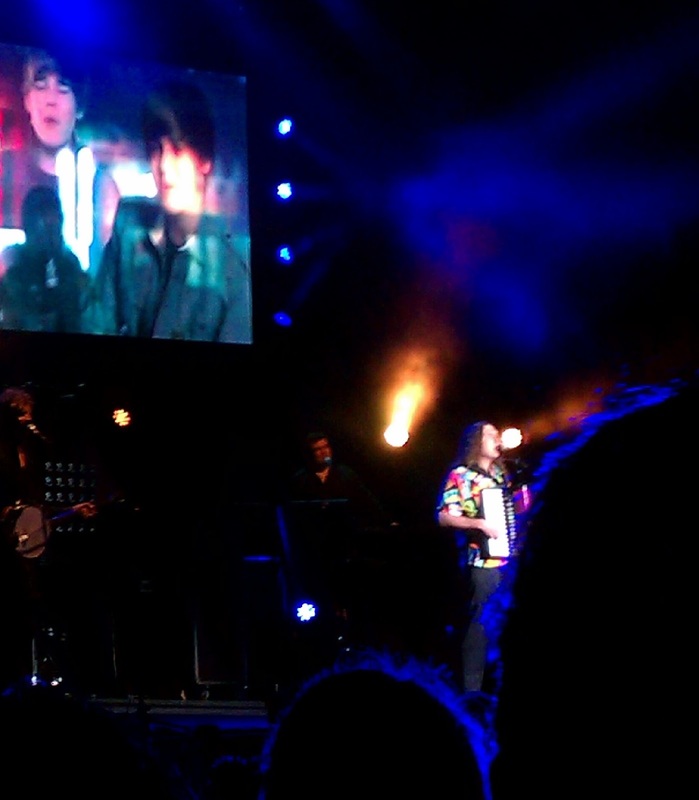 If there was one thing I would change about the concert, it's being able to hear the words better. Most of the time, unless I knew the words already, I had a hard understanding what he was singing. This is a problem when the strength of parody comes form the words. Occasionally, there were helpful accompanying video animations, but these did not replace being able to hear the words. Actually, this is a problem with many rock concerts I have been to, which is puzzling. Maybe other people care less than I about being able to hear the lyrics. Or maybe it's just the venues. Do these people just tour with him? We couldn't decide. Why does Weird Al survive in the parody market while others fall? Perhaps because he doesn't really injure anyone with his parodies. They aren't malicious and probably advertise the original songs as much as make fun of them. Some of his parodies might be more popular than the original songs (as in the case of "White and Nerdy"). Or maybe he just knows how to exploit his fans. Anyway, he's good at what he does. Favorite new song (to me, anyway)? "Party in the CIA." *Of the people I follow on Twitter, he has the most consistently funny tweets (@alyankovic). 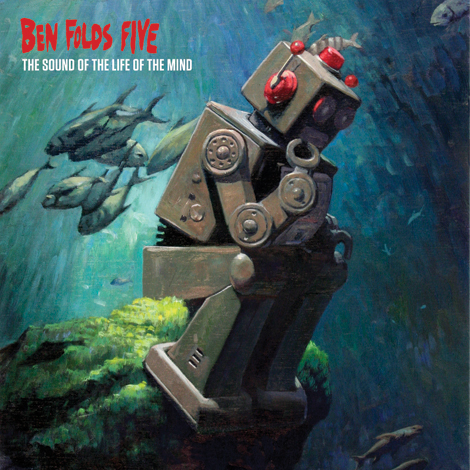 I'm finally getting around to reviewing Ben Folds Five reunion album Sound of the Life of the Mind. Although I've never counted myself a Ben Folds fan, I've had friends who were, and a few years ago I got a used copy of Whatever and Ever Amen for cheap and liked most tracks. I felt a little more invested since I moved to Chapel Hill, North Carolina, where the band got its start. * You gotta hand it to a group who believed in acoustic piano rock enough that they used to personally haul a grand piano around to all their gigs (not to mention the drum kit). Not many proponents of that genre out there anymore. Overall, I think the album was worth listening to. The music is, for the most part, inspired, exciting, and memorable. It's different than most contemporary pop and varied within the album. Folds' music improves with the contributions his old bandmates. One musical complaint: though I enjoyed the power sound, sometimes the group concentrated too much on trying to make a big sound with just three people (lots of quickly repeated, loud piano chords, bass distortion, and cymbal overdrive), as if they felt they had to prove themselves. All the extra white, unpitched noise obscures the words at the wrong moments. Then again, the words aren't really something that redeems this album. There's often a mismatch between grand music and trivial lyrics. "Draw a Crowd" is an example of where the music is strong and catchy but the lyrics just don't live up to the music. I'm left feeling guilty for liking the music (though this track isn't exempt from the previously-mentioned noise-overload, either). It's like they're saying "If I shout and play loud, I'll make it important." Their shouting and fist-shaking was important to their original college-band ethos, a point discussed in this intriguing essay on Buzzfeed: "Ben Folds Five Reunited and I Broke Up with Them" by Rachael Maddux. Maddux tells her story of how the group (and their fans) haven't really changed since they broke up, except everyone is older now; and that's a bad thing: "They’re as sturdy and stubborn as they’ve always been. They never changed. I did." Listening to the album, I think Maddux has a point: the group's lyric focus is still "me, me, me," when maybe I hoped that the group would have matured a bit as they aged. The highlight of the album is "Being Frank," sung from the point of view of Frank Sinatra at the end of his life; the lyrics and music unite to tell the story, a story deeper than mid-20s angst from middle-aged men. They aren't trying to wow us, and the music doesn't stay loud and big for too long. "Hold That Thought" also comes close to this ideal, too. "Thank You for Breaking My Heart" works too, though still a little too "this is about me and not you" in the same way as their most famous hit, "Brick." In conclusion, Sound of the Life of the Mind is worth a listen, especially for Ben Folds fans. You might also consider just (legally) downloading a few of the better tracks. *A new music video with Fraggles didn't hurt, either.